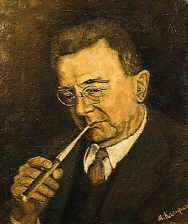 Franz Schmidt (1874-1939) is one of my favourite composers, so I am more tolerant of recordings etc than I can expect of the general reader. 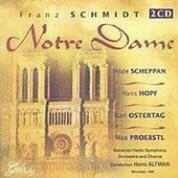 I have received this week a 1949 recording of the opera Notre Dame and sample study scores of Franz Schmidt's music. This recording of Notre Dame comes out a bit rough, but you can quickly become accustomed to the sound of the 1949 recording. More seriously, there is no libretto (it is said to be a poor one, but that needs re-evaluating; my guess judging from the synopsis is that it is no worse than many that have passed muster) and so you have to listen to it more or less as symphonic music, which indeed a lot of the score is (a search of libretti websites has drawn a blank). The most famous excerpt, often played separately, is the first Intermezzo, glorious, sumptuous music. The cast is adequate, conducted by Hans Altmann and headed by Hilde Scheppan, Max Proebstl, Hans Hopf & Wilhelm Schlichting. There is a bonus (the two discs are well filled) of four arias sung by Hans Hopf, those from Fidelio and Lohengrin the best. In short, I'm glad to have heard it, but am unable to fully recommend it. There is available another version, with Gwyneth Jones, James King and Kurt Moll, which sounds more promising and, from the half dozen short samples available on Amazon, where it is described as "a work for those who know their Wagner, Bruckner, Strauss and Mahler by heart", considerably more vivid - Capriccio 10248; worth exploring. Schmidt's piano music was composed for the powerful one-handed pianist Paul Wittgenstein, who had lost his right arm in the 1914-18 war. This is the first recording of the concerto in the original version, and it has to be conceded that some help was probably needed to balance the piano with a full symphony orchestra. It is, typically for this composer, a leisurely work lasting a full three-quarters of an hour; it would be strenuous to perform in concert, but Friedrich Wührer's ill advised expansion of the part for two hands has failed to give the concerto the established position in the repertoire which it merits. Karl-Andreas Kolly makes a good case for it with the Vienna Youth Orchestra conducted by Herbert Böck, and they relish Schmidt's own orchestration of his gigantic organ Chaconne in C# minor, a single span lasting 26 mins! The Repertoire Explorer study scores from the Association Celibidache are introduced as an 'exciting new project for a decisive increase in the availability of orchestral and chamber music repertoires'. They are handsomely produced in a convenient medium size format (9X6.3 inch); good to handle and easy to read - the full catalogue is at Musikmph.de. 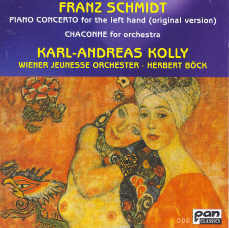 I was disappointed that Schmidt's 1934 piano concerto for the left hand is necessarily reproduced in Friedrich Wührer's two-handed version (Universal Edition, 1952). A study score should ideally have had the original piano part too. 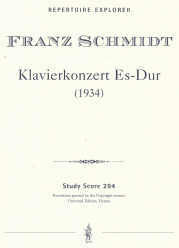 Schmidt's piano music for piano-left hand is an uniquely valuable corpus, and it is seriously compromised when played two-handedly. Since writing this, I have been delighted to discover my strongly held opinion on this issue endorsed in Hans Brofeldt's invaluable, indeed indispensible, website. Schmidt has been generally unfortunate; he was one of the anti-progressive composers whose originality tends to be overlooked, and he was left behind by fashion. Harold Truscott completed only Volume 1 of a projected 3-volume study (Toccata Press 1984), having encountered difficulties in gaining access to the Schmidt archives (see article by Guy Rickards).